The right pendant light can add an instant style upgrade to your room. Aside from illuminating spaces, pendant lights add instant chic to indoor spaces and add to a cohesive look. Modern pendants offer unmatched diversity ranging from understated single pendant versions as well as multi-light pendants. Regardless of your décor style, you can find a contemporary pendant that suits your space – from whimsical and fun styles to those with clean lines. What are the Different Types of Pendant Lighting? When it comes to choosing your ceiling lighting, you have a multitude of options. Pendant lighting is suitable for more than just dining areas. These adaptable fixtures shine in a variety of settings and can serve as the finishing touch to a well-appointed space. The versatility of pendants goes as far as your imagination allows and, aside from casual and formal dining areas, these hanging lights bring sophistication and style to kitchens, long corridors, and home office spaces. Small and mini pendant lights look great in indoor spaces like foyers, reading nooks, and bathrooms. Large hanging lamps or multi-light fixtures are best suited to indoor spaces like dining rooms and kitchen pendant lights provide bright task lighting where you need it most. Single pendants also look great when grouped together and suspended at various heights for a bold statement. When hanging a pendant over a table, the ideal drop is between 28 and 32 inches, but you can experiment with different heights to find the look to complete your space. Another consideration is what type of lighting you need in your space. If you are hanging your pendant in a dining area, choose a fixture that emits ambient, or soft light. If you intend to use your pendant in an office, then task lighting is a better option. Choosing a compatible bulb for your fixture will help you achieve the desired illumination. Modern pendant lighting has evolved over the years to become more refined while incorporating remarkable contemporary elements like cracked glass shades, highly-reflective specialty shades, and irregularly shaped shades that support modern décor. No matter how futuristic pendant designs become, there is still a plethora of pendant silhouettes that are truly timeless and look good in almost any space. For inspiration, you’ll find an unmatched selection of extraordinary pendant choices in this assortment. Here you'll discover top interior lighting brands, including Visual Comfort and the iconic Nelson Bubble Lamps. From ultramodern pendants by SONNEMAN Lighting and Tech Lighting to refined and minimalist suspensions from FLOS Lighting. With so many versatile pendant lighting options, you may have a hard time choosing just one. So how do you choose the best pendant for your space? You can start by taking stock of the space where you want to install the pendant. Understanding the tone of the room gives you a great place to make your selection. 1. Start by understanding the purpose of the pendant lighting you are choosing. In certain rooms, a light fixture serves a more functional purpose rather than fashionable. For instance, the pendants you choose to hang over your kitchen island will provide functional, task-oriented illumination while the lighting at the front door is meant to captivate guests of your home. 2. Next, understand the right size of hanging light to select and how many you will want to install. Begin by knowing the square footage of the room you plan to add this type of lighting in. You'll need to consider the ceiling height (including vaulted and sloped ceilings) to help you make the best choice. 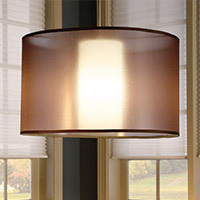 Be mindful of all sizing dimensions including width, depth, height and even weight of a fixture you are interested in. 3. Look for pendant lights that will complement your existing color palette. From vibrant reds and blues to conservative greyscale designs, this assortment has it all. Consider the finishes of hardware on the light fixture as well. 4. The light source of the pendant is another important consideration. LED pendants will emit a different amount of light compared to those using halogen or incandescent light sources. You'll also want to be mindful of the brightness the fixture produces. Be sure to take a look at our guide on interpreting lumens too. 5. Other things to consider when choosing a pendant for your home include the ease of installation and maintenance simplicity. For example, if you plan to install hanging lights on a sloped surface or a vaulted ceiling, be sure you invest in all necessary connectors, suspension cables, dimmers, and installation hardware and consider how the fixture will be cleaned and maintained. As always, we recommend consulting with your electrician. With these simple steps in mind, you're ready to find the right hanging lamps for your home. If you have any questions about the pendants found in this assortment, please call our lighting experts at 877.445.4486. Improve the energy efficiency of your home with LED pendant lighting. While eco-friendly, these LED options also feature beautifully modern designs you'll love having in your home. to improve the overall energy efficiency of your home. Determine how the pendants you choose will mix and match with other forms of lighting in your home. Appropriately layer the amount of lighting in a given room with the addition of wall sconces and modern lamps. Lastly, if you're searching for outdoor hanging lights, remember to keep in mind the UL rating of the fixture as not all lighting types were meant for the great outdoors.